In case you haven't noticed it, there was a bit of a fuss this week when Jeff Jarvis, professor at the City University of New York's Graduate School of Journalism, used his influence to force Esquire magazine to pull down an article that they claimed was satire. Update: I have added another section to this article diving into some of the common replies people made to this article. See below. Also note: While this article uses the Esquire story as the example, the point of this post isn't explicitly related to just that story. My article below is about satire in the media as a whole. How should publishers think about satire so as to not erode their readers trust in them. The first thing you think when hearing about this is 'that it can't be right'. How can a professor of journalism be instrumental in taking down a satiric article? Doesn't that go against everything we know as journalists? Aren't we supposed to protect satire as a form of free speech? Well, yes. But this wasn't satire. 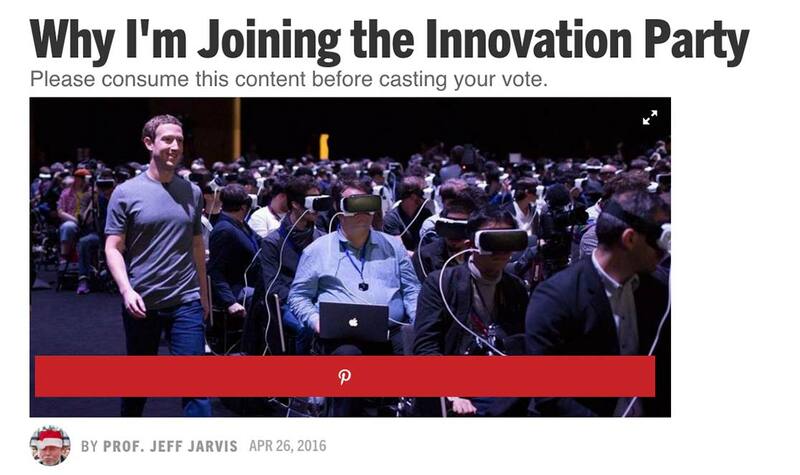 What happened was that Rurik Bradbury convinced Esquire to post an article under his pseudonym Prof. Jeff Jarvis, announcing his intention to 'join the innovation party'. It wasn't really offensive in any way, it just made fun of the whole tech world, and also Jeff Jarvis' fascination with it, which is no secret. Jeff Jarvis wrote (the excellent) 'What Would Google Do?' and is a frequent advocate of a pro-tech approach to journalism. The problem wasn't really the story, but that people didn't know that it was a satire. When people arrived at Esquire's site, they would only see the byline 'By Prof. Jeff Jarvis'. Let me say this first. Satire is a very important form of free speech. Nobody wants to outlaw satire. In fact, satire is often instrumental in raising important questions and topics that are often hard to convey using more serious forms of reporting. And our history is littered with great examples of satire that have both been in the public interest, and acted for the public good. If you don't realize how important satire is, just look at Turkey and president Recep Tayyip Erdo?an, and you will see what happens when you outlaw it. It's scary as hell. So we need satire, and not just the good kind. We need satire because of satire. It's vitally important for a healthy and free society. The problem, however, is that satire is also a form of deception. It's basically a lie, used creatively to raise important questions or issues. And what makes the difference between something being satire and something being a lie, is whether people realize it. Let me give you an example from the good old days. I live in Denmark, and we have a long history of satire. One of greatest examples is from a show called 'The Circus Act' (Cirkusrevyen), where highly famous comedian have long used satire to make fun of other people. 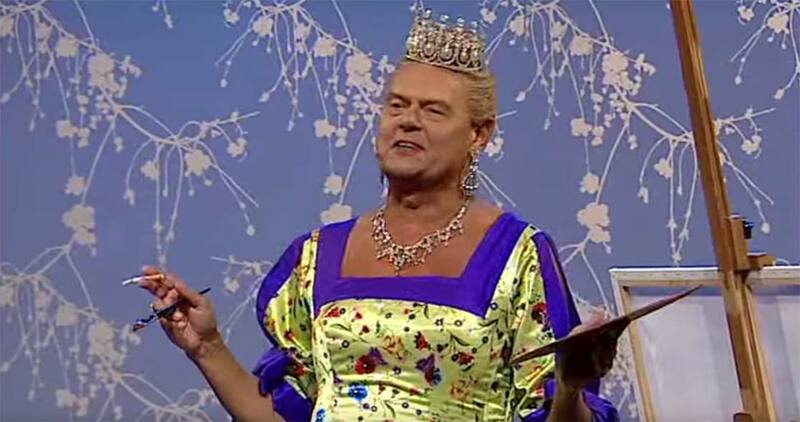 Here is one example of a Danish comedian, Ulf Pilgaard, having dressed up as and making fun of the Queen of Denmark, complete with a paintbrush and a cigarette. It is funny as hell. But here is the thing. At no point do you have any doubt that this is satire. Sure, he is pretending to be the queen, but everyone knows that he is not. Imagine if this wasn't the case. Imagine that this show had been promoted as hosting the actual queen, imagine if the disguise was so perfect that it looked exactly like her, and imagine if it was presented as a press conference. Imagine if you came to this event thinking that this was the real queen. If you take away the knowledge of it being satire, you are left with only the deception and the lie. In other words, if people don't know something is satire, it's a deception. It's the knowledge that something is satire that makes it satire in the first place. And this was what was wrong with the article in Esquire. People didn't know it was satire, nor did Esquire make it obvious that it was. As a result, it wasn't satire at all. It was a deception. And this was what Jeff Jarvis reacted to, and why I posted on Twitter that I completely agree with (the real) Jeff Jarvis on this. Mind you, one thing I don't agree with Jeff about is that this is about his reputation. Esquire, or any other publishers, don't have the responsibility to protect other people's reputations. It doesn't matter if Jeff Jarvis felt offended by it. What does matter though is the responsibility that Esquire and everyone else has to its readers. Esquire has a responsibility to you and me to make sure that every article is trustworthy. And this is where they failed. They posted this article with a byline that intentionally misled its own readers. It wasn't that it offended Jeff Jarvis that mattered; it offended you and me as their readers. When you go to Esquire or any other magazine, you have to trust that they will not mislead you, or lie to you. You have to be able to trust the media. This doesn't mean that Esquire cannot publish satire. But it does mean that it is vitally important that people know that it's satire. Because if you don't, you, as a publisher, are lying to your readers. You are deceiving them. That's not satire, nor is that a good way to run a media company. And this is important, because trust is the single biggest problem currently facing the media. I wrote about this in "The Increasing Problem With the Misinformed", in which the media plays a role. But you can also just look at the latest repost from American Press Institute on "Trust In Media". 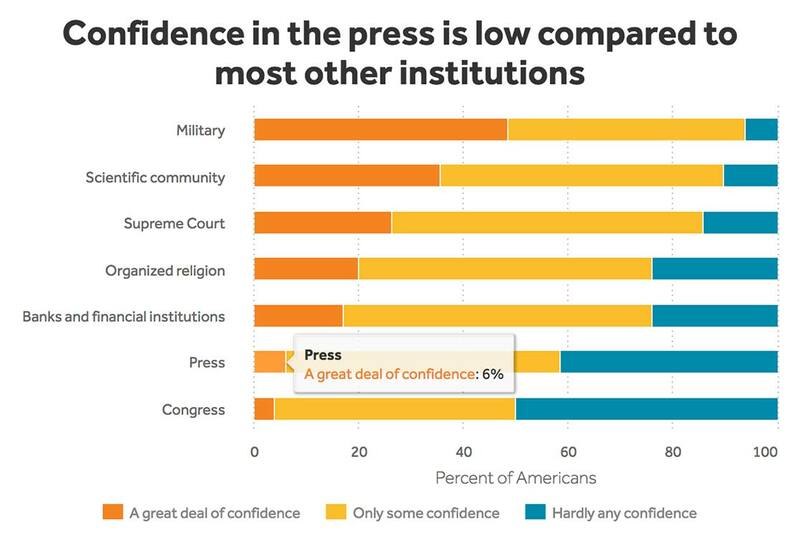 Here we find that only 6% now has 'a great deal of confidence' in the press. We only barely make it above the politicians (which are at 4%). 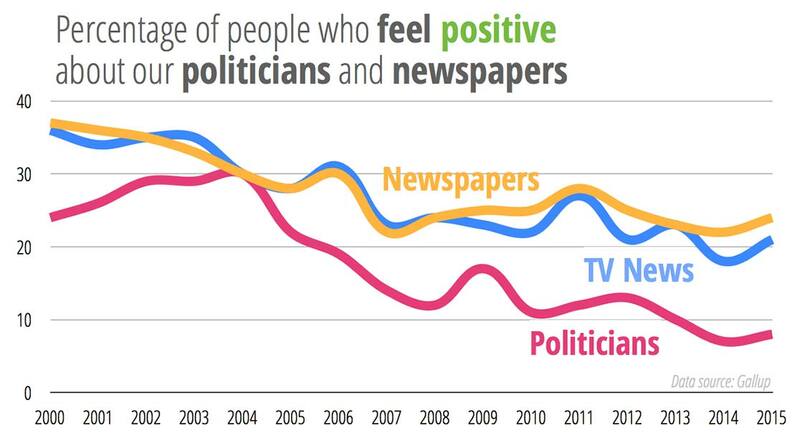 And this follows a continual decline in trust in the media. Here are the numbers from Gallup from the past 15 years. This is a problem we see with Esquire's decision to publish that article. It acted in an untrustworthy way towards its own readers. It deceived them. And while satire is only a small part of the trust issue, it's an important one. It's vital that we stay true to our readers, which is why it's vital that we distinguish between real satire and a deception. I will say this again. It's the knowledge that something is satire that makes it satire in the first place. After publishing this article, I got a number of (angry) comments over at Twitter, saying that my definition of satire is completely wrong and dangerous. The main argument appears to be that it shouldn't be up to the stupidest of readers to define whether something is satire or not. In other words, just because people don't know that it's satire, doesn't mean that it isn't. Also, some people went on to say that satire is not defined by the readers at all, but by the intention of the creator. I kind of agree with this. Even if an article is clearly labelled as satire, some people will always miss that clue and read the rest of the article as if it were true. And I agree that we can't outlaw satire just because some people don't pay attention. Nor am I even suggesting we outlaw anything. But that doesn't change my original point that it is only satire if people know about it, or potentially realize it afterward. Let me give you a couple of examples. And mind you, I'm not talking about this as a legal definition. I'm talking about this as a media analyst, trying to advise publishers how to think and approach satire in their publications. It's quite possible that you can get away with all kinds of things in a court of law, but that doesn't really change the point here that publishers need to be accountable to their readers. Back in 1938, CBS Radio decided to create a version of H.G. Wells' famous novel about a martian attack on Earth as a simulated news broadcast. It was designed in a way so it appeared as being completely real. And quite famously, a lot of people believed it. In other words, it was a form of satire, but people didn't realize it at the time. The keyword here, to me, is 'at the time'. ANNOUNCER TWO: Ladies and gentlemen, following on from the news given in our bulletin a moment ago, the Government Meteorological Bureau has requested the large observatories of the country to keep an astronomical watch on any further disturbances occurring on the planet Mars. Due to the unusual nature of this occurrence, we have arranged an interview with noted astronomer Professor Pierson, who will give us his views on the event. In a few moments we will take you to the Princeton Observatory at Princeton, New Jersey. So imagine that you didn't know what you were listening to, and you heard this. It's quite likely that you would believe that it was real. It sounded real. And this was exactly what happened. Thousands of people were fooled into thinking it really happened, and because they didn't have social media to disprove it, people generally went into a bit of a frenzy. That's a great example of satire, right? You see, what makes this a truly remarkable example of satire is when people realized that they had been fooled. It's that moment when everyone goes, "Ohhhhh...!!" Sure, quite a lot people got angry about it too, but that's also the nature of satire. It's not designed exclusively to please people. It's designed to be eye-opening. Here, again, we come back to what I said. It's the knowledge that something is satire that makes it satire in the first place. This radio show wasn't satire until people realized it. Up to that point, it was simply just a deception and a lie. It's the reveal that made it satire. Imagine if CBS radio had kept it a secret that it was all a lie. Then it wouldn't have been satire at all... it would just be... a lie. Granted, legally, satire might be defined by the intention of the creator, but ethically, it's defined by that moment when it's revealed. And this is the problem that I have with so much so-called satire online. People claim that something is satire, but you keep it a secret so that nobody ever realizes it. That isn't satire. That's just a lie. Imagine that a journalist for a newspaper decides to write an article about you. But instead of actually interviewing you, he just makes up his story. He writes that he has done an exclusive interview with you (which isn't true), and he includes a number of quotes from you (which you never said). So, what would you do about it? Well, you would probably pick up the phone and call the Editor In Chief of the newspapers. You would tell him that you never did an interview with this journalist, nor did you say any of the things in the article. What would likely happen next is that the editor would storm into where the journalist is sitting and demand an explanation. And when the editor discovers that the journalist had just made up his sources, he would be fired. In fact, this has happened many times before. A few months ago, a sports journalist from a newspaper in my country did just this, and was promptly fired because of it. Journalists are not allowed to lie to their readers. They are not allowed to just make up quotes and invent sources. But what if, when the editor had stormed into his office, the journalist had simply said, "Oh, I meant it as satire!" Is it then alright? No, of course not. This journalist might claim it was satire, but he had still lied to both the readers and the editors. The editor didn't know it was made up. He didn't know that it was intended to be satire. So, the journalist is fired anyway. He lied, and he kept his intentions a secret. But, what if the editor had known about it. Could then editor then just say, "Oh... but it's satire?" Again, no. Well, legally, you could probably get away with it, but it's the same problem. To the readers, the editor and the journalist lied. And just like the journalist was fired before, shouldn't both the editor and the journalist be fired now? You see the problem here? The intention of the creator was never revealed to the receivers (aka the readers). As such, they might claim it was satire, but to the public it wasn't. Publishers don't get to imagine sources, statements and fake quotes without making it clear it's done for reasons of satire. Satire only becomes satire when it's revealed as such. If a publisher never reveals it, it is just lying. This the key, and the point I'm trying to make. Legally, you might disagree with me, but ethically it's pretty obvious. Satire and lies are two different things, differentiated by the knowledge of the intention of why it was done. Mind you, this is an even bigger problem online. Back in 1938, CBS could (kind of) get away with fooling people for about two hours. But immediately after that, everyone knew it was 'a joke'... because it was clear to everyone that we weren't invaded by Martians. It was an easily discovered truth. In today's world, however, this isn't really the case. Every week (day?) we see hoaxes online by sites or people pretending to be something they are not, or that something happened but didn't. But unlike in 1938, it's not as obvious today when something is a hoax. Which means that instead of fooling people as a form of satire, you are actually just misleading people. People will think something is true, and they will keep thinking that forever because the 'reveal' never reaches them. So, our responsibility to our readers is much higher today than ever in the past. Again, legally, it's a gray zone. But as a publisher, it's really not. Some people will still be fooled. I mean, there are people who believe the Earth is flat. But my point is that it's not the goal for a publisher to mislead its readers, not even through satire. The goal is to enlighten the readers, to do something eye-opening. And sometimes, satire is a great way to do that. But only if people realize that it's so.